Package contains six - 18 inch quilt blocks. 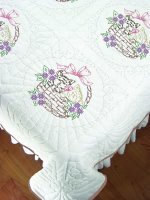 The pattern is standard embroidery stitch only and DOES have quilting marks. OPTIONAL BORDER BLOCKS ARE AVAILABLE. Please see below for all coordinating items. Floss, hoop, batting, and backing not included. Suggested quilt requirements with 15 inch border: Standard-2 packages, Queen-3 packages, and King-4 packages. This product was added to our catalog on Tuesday 03 March, 2009.